The Kindle Fire was first released to the public in mid-November 2011 after a much-hyped product announcement by Amazon CEO Jeff Bezos in October. Sales have been impressive, but three months later, how satisfied are customers with their purchases? ChangeWave Research, a part of analytics and data research firm 451 Research, set out to research just that, interviewing a sampling of 254 North American Kindle Fire owners. What they found is an elusive data set, which can serve as a kind of Rorschach Test to be used as evidence by those who say the Kindle Fire is a disappointing bust, as well as by those who see the device as a well-made, low-cost iPad alternative. There are essentially two camps in the argument over the Kindle Fire's worth and its place in the Tablet Universe: Those who write off the Kindle Fire as cheap, clunky and non-functional, and a weak replacement for the iPad, and those who applaud it as a fundamentally different kind of tablet than the iPad, due to its smaller size and lower price -- an inexpensive, user-friendly device that, though not as robust as the $500-and-up iPad, can still do everything on the multimedia side you could reasonably want a $200 tablet to do. "While the 54 percent "very satisfied" rating for the Kindle Fire is considerably below the 74 percent rating of the industry-leading Apple iPad," the ChangeWave report notes, "It is higher than the 49% average rating for all of the other tablet devices combined." What the graph shows, then, is both sides of the argument: A doubter could argue that this is more evidence of the inferiority of the Kindle Fire, citing the high satisfaction rates of the iPad versus the relatively low satisfaction rates of the Kindle Fire. An optimist could say, "Well, of course the Kindle Fire doesn't score as highly as the iPad; the Fire costs $300 less than the most barebones iPad and is first-generation -- and what's more, scores higher than the aggregate of non-iPad alternatives in ChangeWave's survey." A good ol' fashioned "He Said, She Said"! The Kindle Fire continues to straddle that fence between antipathy and admiration, attracting highly passionate (and often very loud) boosters and detractors. Adding fodder to the feud are these further bits of research, which list users' biggest likes and dislikes about the Kindle Fire. Again, you're going to see a bunch of familiar raves and complaints, especially if you've been following the major news coverage surrounding the Fire. The Kindle Fire's price ($199), brilliant color screen and ease-of-access to both media in the store and on the tablet are three of the Amazon tablet's most commonly cited advantages; the lack of physical volume buttons, camera and 3G capability, meanwhile, are three consistent bugaboos of the Kindle Fire's critics. (Worth noting: Privacy concerns and a balky touchscreen -- two of the major faults brought up in a much-circulated New York Times article from December -- do not make appearances on the list of top user dislikes). Also not making an appearance here: The NOOK Tablet, a true Kindle Fire competitor at a similar price of $250 and featuring a 7-inch display, the same sized display that's on the Kindle. One can't help but wonder what percentage of NOOK Tablet buyers are "very satisfied" with their purchases, especially given that the NOOK Tablet comes with two features -- volume buttons and great battery life -- that Kindle Fire users disliked so overwhelmingly. In any case, the Kindle Fire is either doing pretty well or pretty awfully, depending on what you believe. 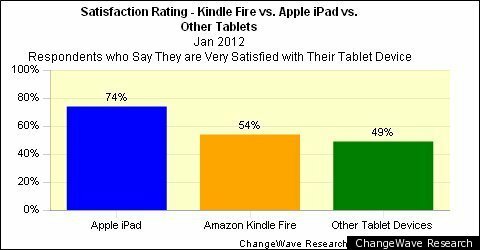 Business Insider, for example, titled its review of the survey "Only Half of Kindle Fire Customers Are Happy WIth Their Device"; Kindle-centric blog KindleFu, meanwhile, titles its post "Survey: More Than Half of Kindle Fire Owners Are 'Very Satisfied,'" finding bright skies where others found rain. It's all a matter of perspective with the Kindle Fire, one of the more controversial pieces of hardware to have emerged in 2011. With an updated Kindle Fire rumored to be arriving in spring 2012, we'll have to see which of these user complaints Amazon chooses to address on its re-kindled Fire.